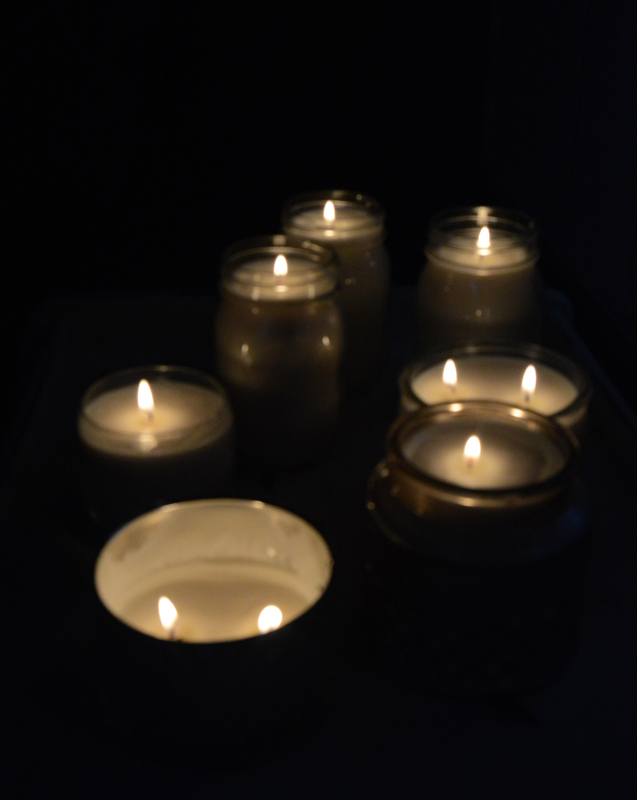 I may have a slight obsession with candles, especially on dark dreary days…or any day actually. Candlelight can create a soft cozy ambiance that is very warm and calming, especially when they are your own homemade candles. Just as a rainy morning can make you want to crawl back in bed, a nostalgic fragrance can transfer you are anywhere. Did you know that lighting a tealight while cutting an onion helps your eyes water less? 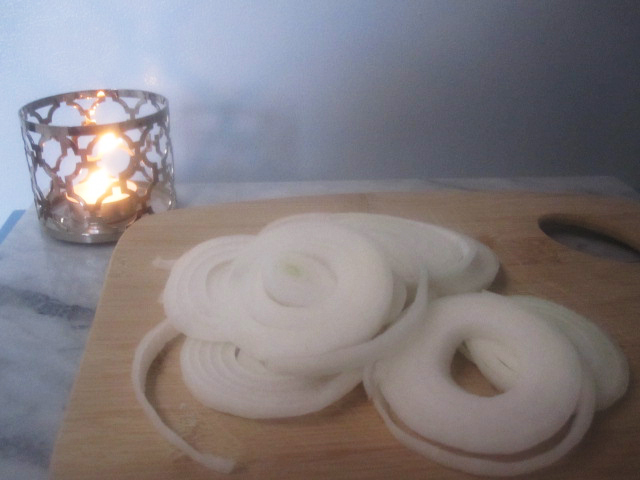 Try it, light a tealight candle in a safe holder at the same level (but at a safe distance) as the onion you are cutting. It helps cut the gas vapors that cause you to tear up. Not sure where this tip originated from but it works for me. Burning a lot of candles can get expensive, so I started searching the clearance shelves for inexpensive candles that no one else wanted. Usually you can find cheap ones during the change of a season. Most people don’t want to smell Christmas trees when they just got back from the beach…well most anyway. Or, they just simply smell so bad no one wants them. I went through candles so fast that I started feeling very wasteful. That got me thinking what if I could reuse the glass they came in and make my own. So I began my journey of collecting clearance candles even the ones that smelled terrible, once I burned it I could refill with whatever I wanted. I try to find unique containers that can be used again, at a good price…of course. Once I had a bunch of jars to make the candles in I had to order the rest of the supplies. I chose to use soy wax, since it is a natural wax. 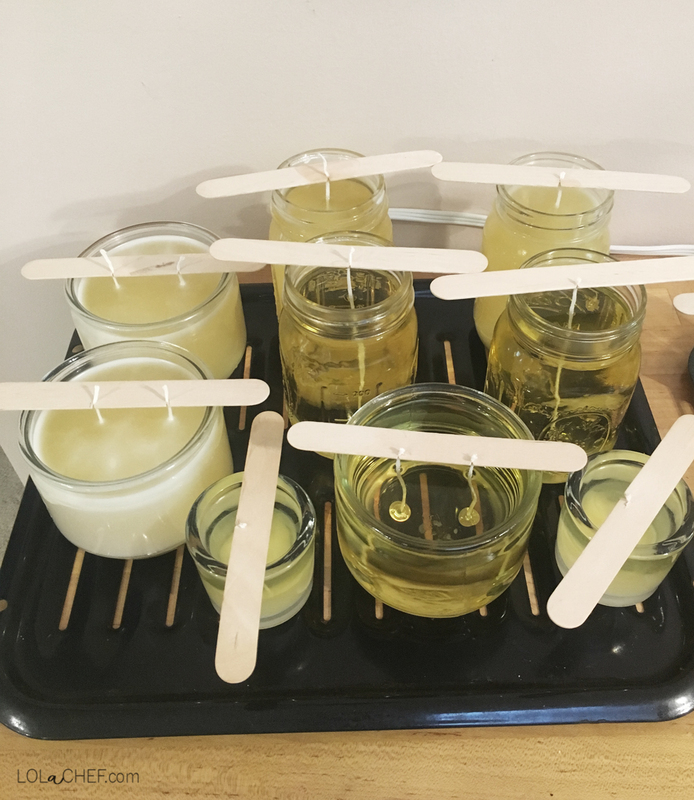 A stove to melt the wax, a heatproof pitcher for the wax, wax flakes of your choice, wick rope and a hinge, popcicle sticks and fragrance of your choice. Large pot, scissors, small wrench clamp, knife, and a pencil or pen to mark the popcicle sticks. 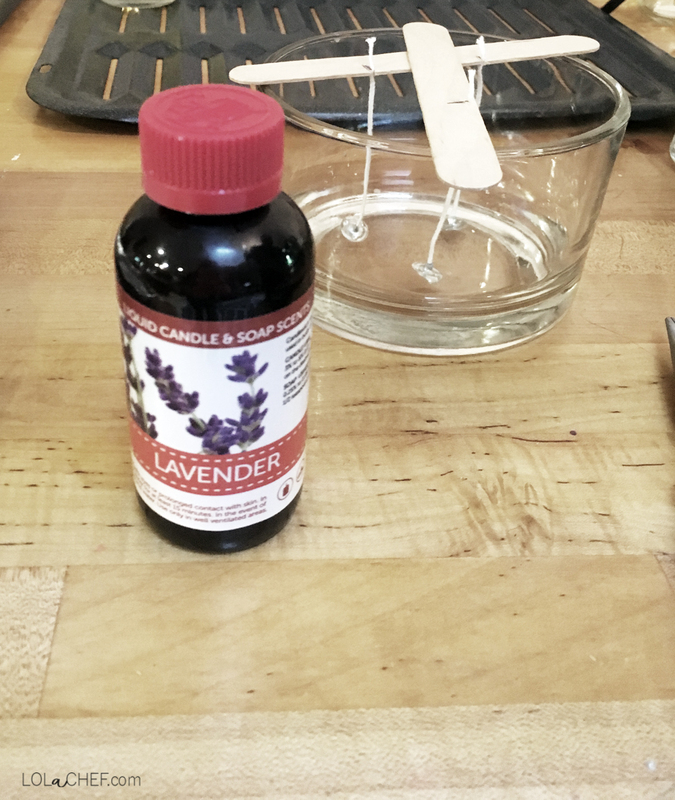 To prepare old jars, clean the glass out by removing old wax and any wicks or pieces that remain. I simple place really hot or boiling water in the glass, let it sit for a few minutes and cool off a bit. Then carefully with oven mitts to hold the glass and a sponge or a rag to wipe out the water and remove any wax. Sometimes I have to repeat to get all the wax out. I set up extra surface areas for the candles to set once the wax was poured in. 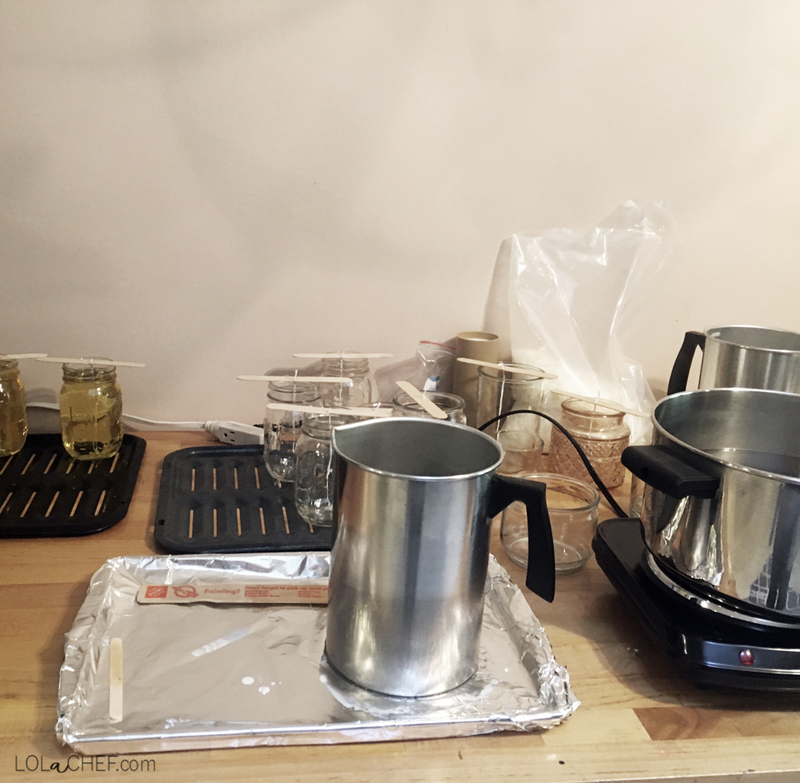 I also covered a cookie sheet with aluminum foil for a place to set the hot wax down for a minute. Once you have everything set out, place pot with water in it on the heater. 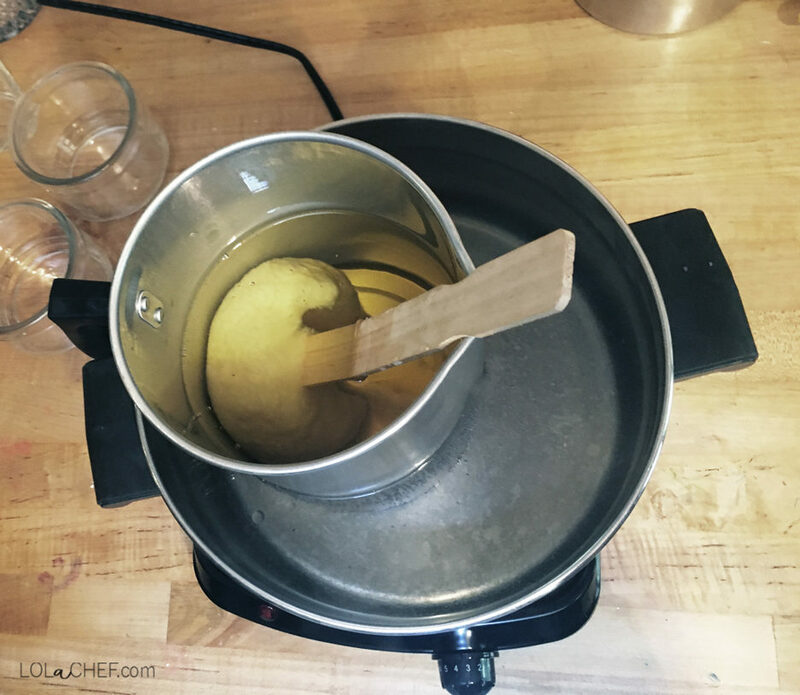 Place the pouring spout with wax inside in the pot. Turn the heat to medium/low. 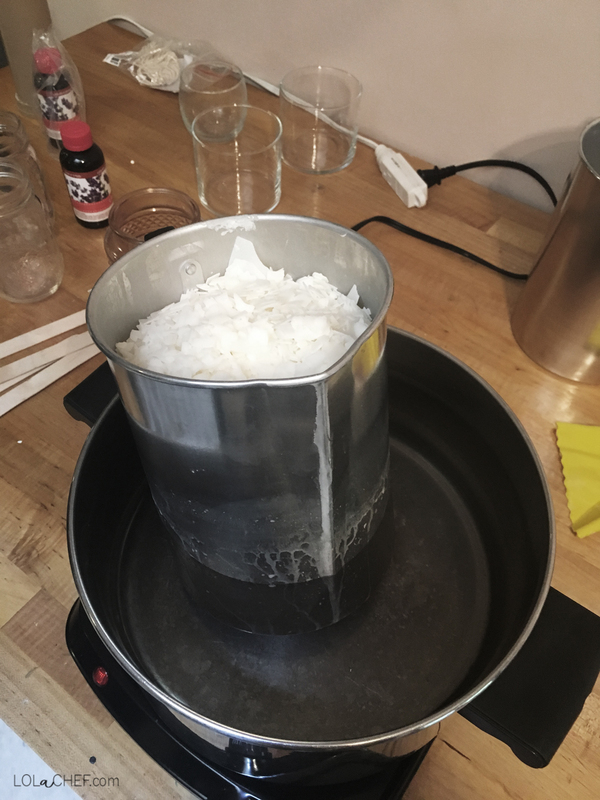 This will slowly heat the water which will melt the wax. 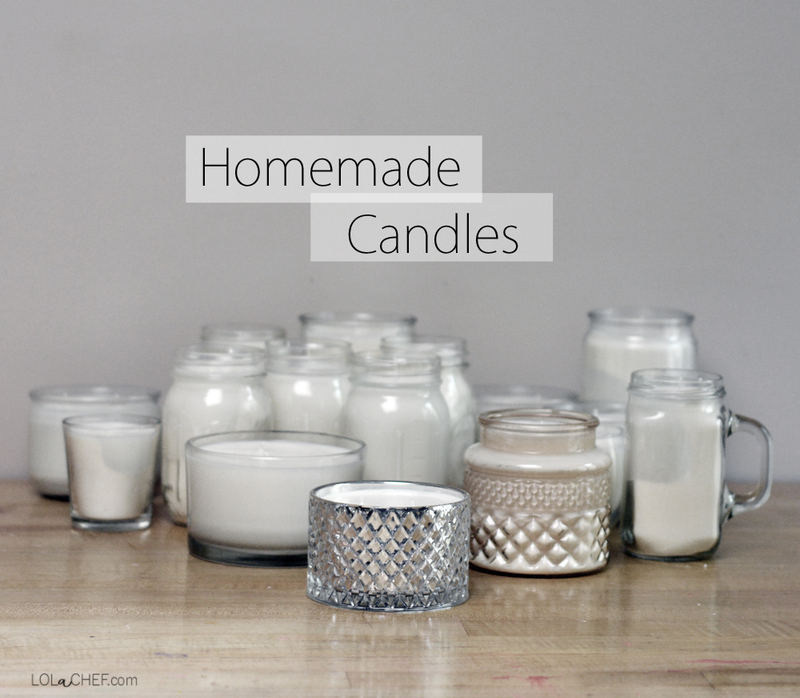 You can add some fragrance to the soy wax pieces. We put a few drops and It worked well. You can add as much as you like. It will take some time to melt the wax. 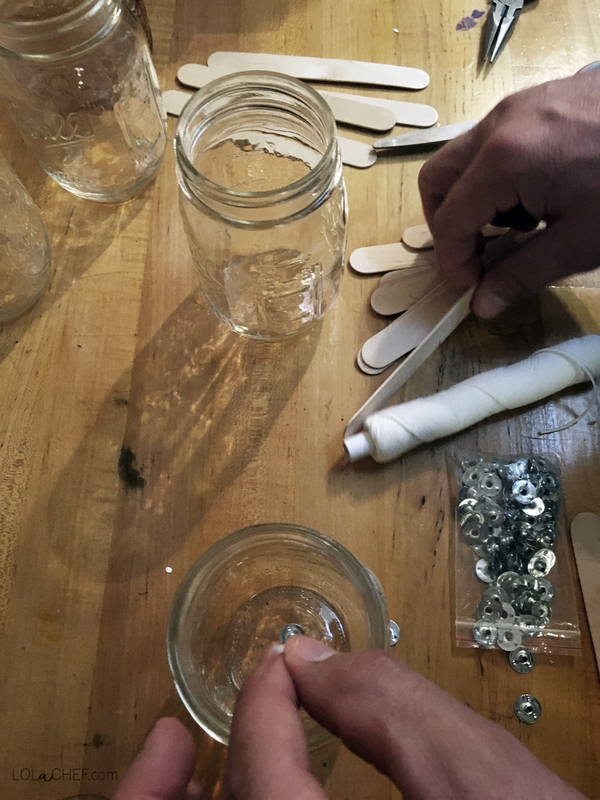 While the wax is melting you can prepare the jars. 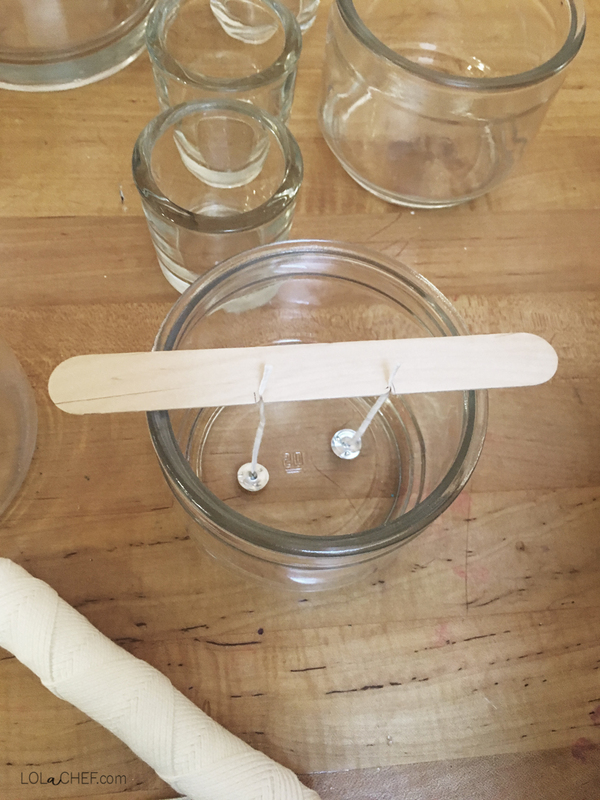 You will take a hinge and piece of wick rope and measure the size of the jar so that the wick is about and inch outside of the top. With a small wrench you will can put the rope through to the hinge is at the end of the rope, then pinch the tip of the hinge to hold rope in place. You can buy the wick rope already attached to the metal hinge on the bottom. The only downside is that they are pre-cut and may not be the right size for your candle. Then you will lay a popcycle stick over the top of the jar, mark where the wick will be set. using a knife make a slit hole that will hold the rope in place. 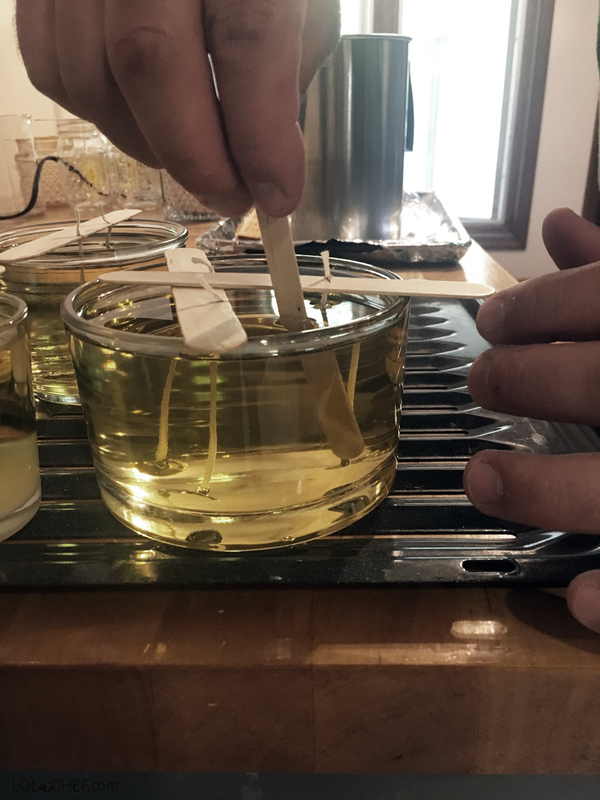 Once the wax is melted, carefully pour the wax into the candle and fill to about a 1 inch from the top. Using another pop cycle stick make sure the hinges are touching the bottom. You can use glue to secure them down. I felt it worked just fine without any. We kept having to melt more wax because we made a lot! 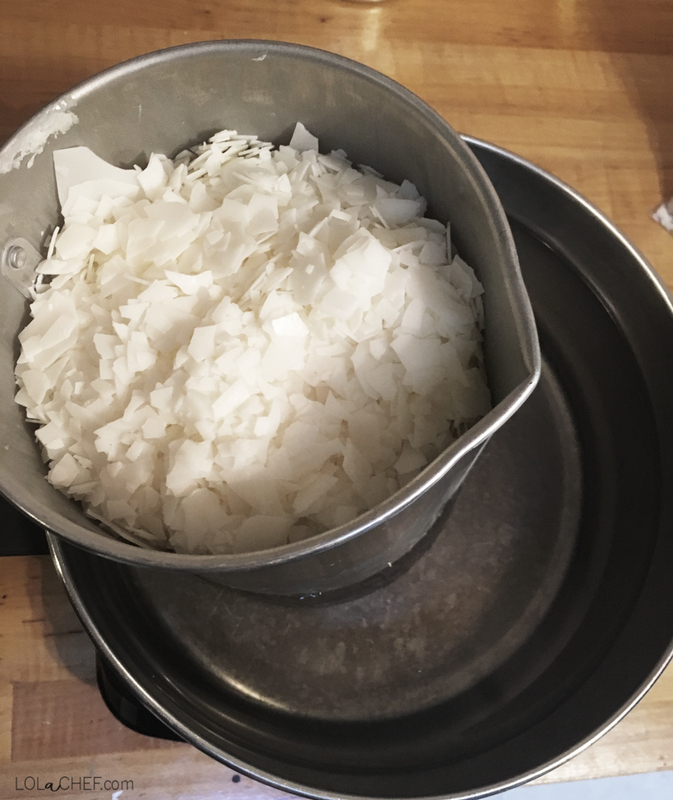 We went through 2, 1 lb bags of soy wax. We made about 15 candles, because you can never have enough candles. Once they are all poured, set aside and let cool for at least 24 hrs. You will see them slowly become a solid and turn white. I haven’t tried adding color, I like them natural…..then they match everything! *this post contains affiliate link for helpful products I recommend, all opinions are my own. Great idea!!! I need to try this. I have spent so much money on candles. Thanks Tracy! I was surprised at how much easier the process was than I originally thought.